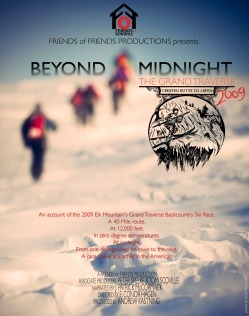 "BEYOND MIDNIGHT: The Grand Traverse"
A documentary film about the 2009 Elk Mountain's Grand Traverse, a truly extraordinary backcountry ski race. The Grand Traverse is an annual backcountry ski race that takes place between Crested Butte, Colorado and Aspen, Colorado. At the end of March, each year, over 250 racers will gather in Crested Butte and attempt to traverse the 40 mile route through some of the most rugged terrain in the Western Hemisphere, and, they will do it at midnight. This race attracts some of the most skilled and knowledgeable backcountry athletes in the country. It is not a race for novices. This film was shot, created, and produced by a group of friends who go by the name FOF PRODUCTIONS. It was thanks to friends of Friends of Friends that we were able to make this film.